Everton made 3 changes from the team that drew with West Ham with Billy coming in for Osman on the left side and Jack Rodwell playing off Saha in a 4-4-1-1 system with Anichebe and Beckford benched. Chelsea played their usual 4-3-3 system with one change from their rout at the Reebok seeing our nemesis Frank Lampard replacing Mikel with Essien playing as anchor. 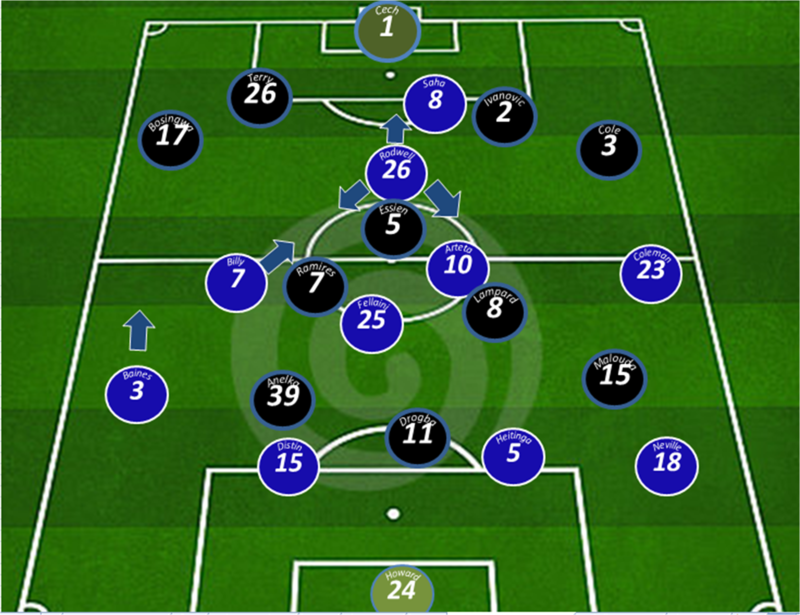 Everton’s strategy was to press Chelsea high up the pitch, regain possession and get the ball into the box as often as possible. 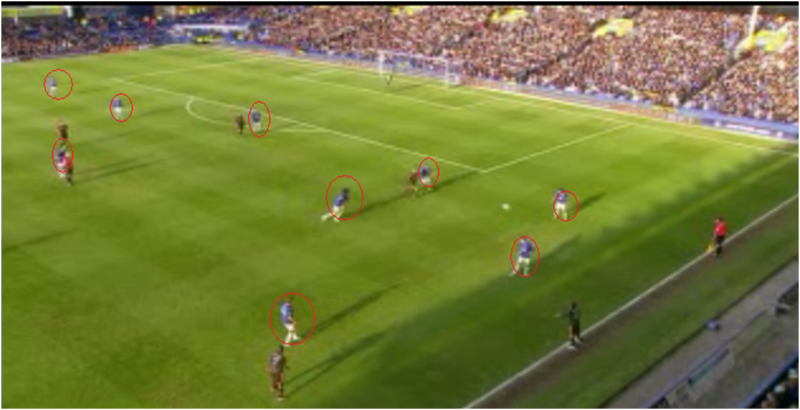 Everton played with Fellaini, Arteta and Rodwell in the centre of midfield to go like for like with Chelsea’s midfield 3 of Essien, Lampard & Ramires. 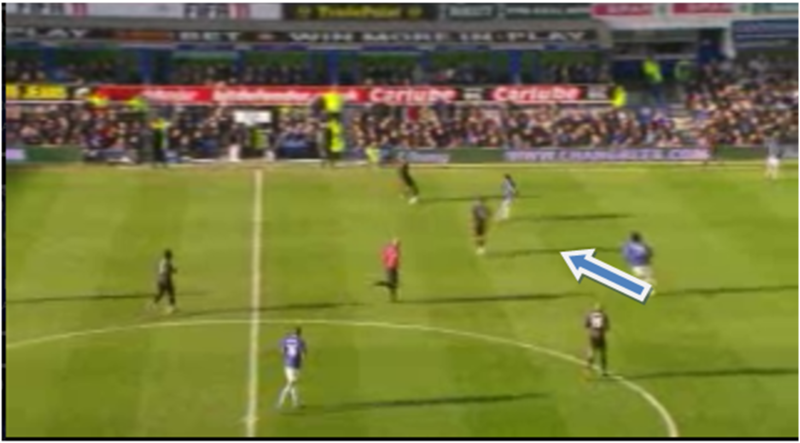 Rodwell had a really good game and played the more advanced of the 3 when Chelsea were in possession although Fellaini was also pushed forward to lurk on the edge of the Chelsea box when we were in possession to meet diagonal aerial balls pitched in for him. The first half was something of a stalemate with only one real clear cut chance for each side. Everton’s steady run of form (just 1 defeat in 10 games) has coincided wih Marouanne Fellaini hitting top form and the big Belgian was again instrumental today. His energy was superb and it was his persistent pressing up field that led to our best chance of the first half when his harrying of Frank Lampard (screenshot A) and then John Terry (screenshot B) forced Chelsea back 40 yards before he finally wins possession allowing Saha to tee up Jack Rodwell who shot straight at Cech. Chelsea were always a threat on the break and almost opened the scoring soon after when Heitinga was caught square by Malouda’s through ball enabling Anelka a clear run at the Blues goal but luckily Howard was equal to his shot and the game was goalless as the half time whistle went. Whilst the first half was fairly even the Blues started the second sharper than their opponents and deservedly took the lead when a trademark Baines corner was met by Saha whose clever movement inside the 18 yard box enabled him to lose Terry and tuck into Cech’s net. Saha deserved the goal for a textbook display, his work rate has been rightly questioned this season but today his effort particularly outside the box was a real boost to the Blues. It was also the 8th assist of Baines productive season. The Blues could have had a second when good work again from Saha led to Baines putting in a great cross which was first met by the excellent Coleman’s head and then after Cech had spilled it Coleman went in to smash it home with his right foot only for a truly superb tackle from Essien to deny him. As well as playing well when with the ball we also showed great focus when Chelsea had the ball, keeping our shape well with few gaps between our defence and midfield (circled in red) making it hard for Chelsea to play through us. Mikel Arteta was another who was playing with more confidence today, with good ball retention and also taking on two long range efforts which went close. His free kick delivery was also improved, whipping in one quality free kick for Fellaini whose header was repelled by Cech. The midfielder was guilty of ball watching on the equalising goal though. 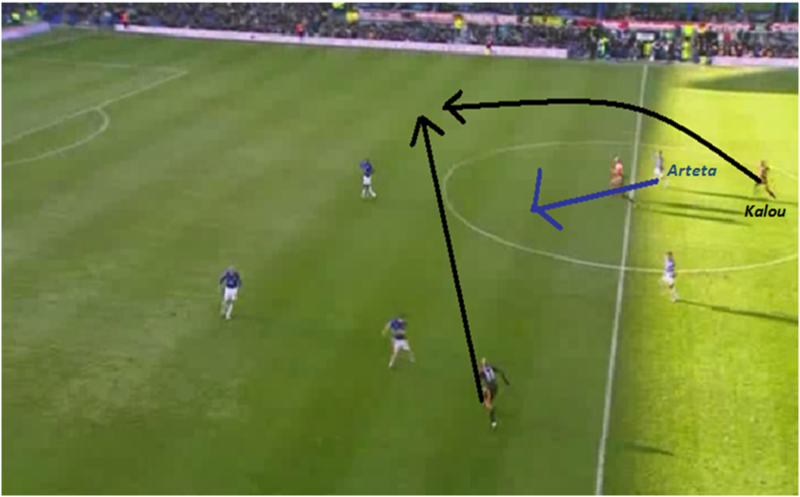 As Anelka broke down the left the Spaniard got sucked into the centre allowing Kalou to make a curved run behind him before dragging a shot past Howard who was slightly unsighted by Distin in front of him. There was still time for both teams to almost win it late on, firstly when Ramires struck a post with a long range drive and then when substitute Jermaine Beckford fizzed a half volley which was well saved by Cech, who had a great game in goal for the West Londoners. There were plenty of positives to take from this cup tie with our midfielders in particular on top form which enabled us to win the key battle in the centre of the park. It was a display of great courage and endeavour mixed with good quality from the Blues and we were unlucky not to progress. A replay at a ground we haven’t won at since 1995, the year we last won the trophy will be a tough ask but with the form we have shown against the top sides and with Cahill back there is no reason why we can’t go there an give them a game. The only worry for me was the way we let Chelsea back into the game, the 9th time we have lost a lead this campaign.